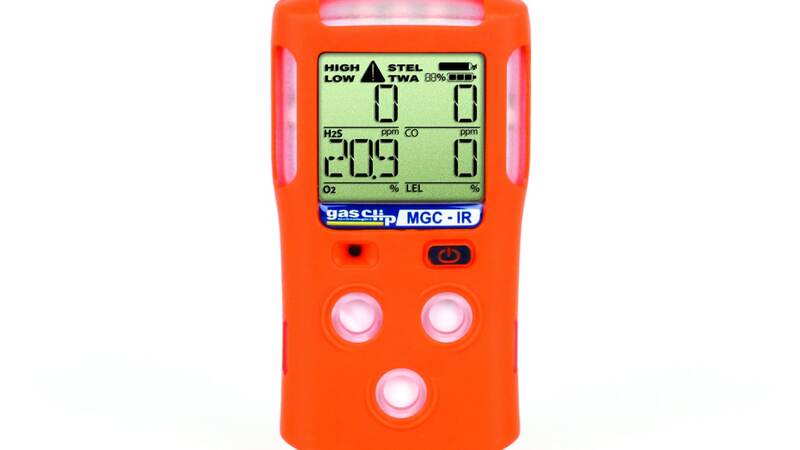 The Multi Gas Clip Infrared portable gas detector for combustible gases (LEL), H₂S, CO & O₂ eliminates the safety risk of running out of battery before the shift is over. A backup detector is not necessary either as this one detector can amazingly run continuously for months on one charge! How is this possible? Gas Clip Technologies has developed the most technologically advanced portable multi gas detector available today. The extended battery life comes from the utilization of low power photometric infrared technology for LEL measurement. No need to frequently calibrate as it is immune to catalytic poison and fails to safety. This reliable detector keeps on detecting combustible gases accurately in oxygen enriched or depleted environments. 100% quality control testing of each Multi Gas Clip ensures low maintenance costs, dependability and unequaled protection. Usage is easy with simple, one button operation. Other features include data logging, full function self-test upon activation and visual, vibrating & audible alarms. Gas Clip Technologies develops innovative portable gas detectors that offer greater reliability, improved productivity, and better cost-efficiency.